At last count there where over 150 active dog packs in the US. While still called fox hunting packs, the majority of them actually tend to hunt coyotes. The quarry may be different, but the practices are very similar to those employed in the UK before the supposed ban. Animals are chased for hours and eventually ripped apart. At the bottom of this page you will find links to many of the active packs. Most “fox” hunting occurs on private land. Check first so you are aware. For a successful hunt with a pack of dogs, the chain of links between the hunter and the dogs and between the dogs and the victim should not be broken. Thus sabbing concentrates on breaking those links. At the start, the lead dog will find and follow the victim by scent. At this stage, it may be possible to distract from the scent of the real victim (with items such as fox urine, bedding, and/or feces freshly taken from your nearest wildlife hospital or sanctuary) or to mask his or her scent with strong smells (e.g. diluted citronella or eucalyptus smells or anti-mate sprays). False trails are generally laid either before the hunt arrives (if you know where they will go) or while they “draw” or seek out a new victim. The trail is laid in line, along hedgerows and the edge of the woods, ideally in a large circle around the immediate vicinity of the hunt. The technique of masking scents is best used when sabbers can both see the victim flee and manage to be on his or her trail before the hounds arrive. In this case, it is important NOT to mask the trail in a line, but to cover a whole area, as a human hunter following the dogs will immediately take the hounds past you and onto the proper line again. Another very effective way to break the link between dogs and quarry is to crack dog whips in the air to get the hounds to stop chasing. Hunters do this if the dogs follow the wrong quarry, and they are well trained to respond to such commands. Hence cracking whips doesn’t just save the particular victim, but also serves to confuse the hounds so they will not know which animal to follow. Also, if done repeatedly and aggressively enough in the right time and the right place, whip cracking will easily halt the pack. 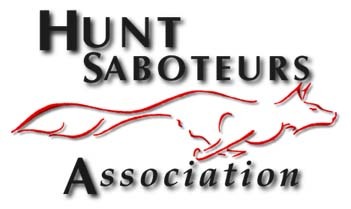 Many additional fox hunting tactics can be found at the Hunt Saboteurs Association website from the UK. You may want to avoid the individuals on the PDF available at http://www.mfha.com/pdf/uspc-contacts.pdf . They are apparently members and supporters of Masters of Foxhounds of North America.